For other uses, see Archimedes (disambiguation). Archimedes of Syracuse (/ˌɑːrkɪˈmiːdiːz/; Greek: Ἀρχιμήδης; c. 287 – c. 212 BC) was a Greek mathematician, physicist, engineer, inventor, and astronomer. Although few details of his life are known, he is regarded as one of the leading scientists in classical antiquity. 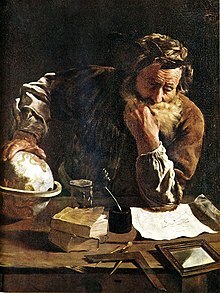 Generally considered the greatest mathematician of antiquity and one of the greatest of all time, Archimedes anticipated modern calculus and analysis by applying concepts of infinitesimals and the method of exhaustion to derive and rigorously prove a range of geometrical theorems, including the area of a circle, the surface area and volume of a sphere, and the area under a parabola. Other mathematical achievements include deriving an accurate approximation of pi, defining and investigating the spiral bearing his name, and creating a system using exponentiation for expressing very large numbers. He was also one of the first to apply mathematics to physical phenomena, founding hydrostatics and statics, including an explanation of the principle of the lever. He is credited with designing innovative machines, such as his screw pump, compound pulleys, and defensive war machines to protect his native Syracuse from invasion. Archimedes died during the Siege of Syracuse when he was killed by a Roman soldier despite orders that he should not be harmed. Cicero describes visiting the tomb of Archimedes, which was surmounted by a sphere and a cylinder, which Archimedes had requested be placed on his tomb to represent his mathematical discoveries. Unlike his inventions, the mathematical writings of Archimedes were little known in antiquity. Mathematicians from Alexandria read and quoted him, but the first comprehensive compilation was not made until c. 530 AD by Isidore of Miletus in Byzantine Constantinople, while commentaries on the works of Archimedes written by Eutocius in the sixth century AD opened them to wider readership for the first time. The relatively few copies of Archimedes' written work that survived through the Middle Ages were an influential source of ideas for scientists during the Renaissance, while the discovery in 1906 of previously unknown works by Archimedes in the Archimedes Palimpsest has provided new insights into how he obtained mathematical results. Archimedes died c. 212 BC during the Second Punic War, when Roman forces under General Marcus Claudius Marcellus captured the city of Syracuse after a two-year-long siege. According to the popular account given by Plutarch, Archimedes was contemplating a mathematical diagram when the city was captured. A Roman soldier commanded him to come and meet General Marcellus but he declined, saying that he had to finish working on the problem. The soldier was enraged by this, and killed Archimedes with his sword. Plutarch also gives a lesser-known account of the death of Archimedes which suggests that he may have been killed while attempting to surrender to a Roman soldier. According to this story, Archimedes was carrying mathematical instruments, and was killed because the soldier thought that they were valuable items. General Marcellus was reportedly angered by the death of Archimedes, as he considered him a valuable scientific asset and had ordered that he must not be harmed. Marcellus called Archimedes "a geometrical Briareus". The last words attributed to Archimedes are "Do not disturb my circles", a reference to the circles in the mathematical drawing that he was supposedly studying when disturbed by the Roman soldier. This quote is often given in Latin as "Noli turbare circulos meos," but there is no reliable evidence that Archimedes uttered these words and they do not appear in the account given by Plutarch. Valerius Maximus, writing in Memorable Doings and Sayings in the 1st century AD, gives the phrase as "...sed protecto manibus puluere 'noli' inquit, 'obsecro, istum disturbare'" – "... but protecting the dust with his hands, said 'I beg of you, do not disturb this.'" The phrase is also given in Katharevousa Greek as "μὴ μου τοὺς κύκλους τάραττε!" (Mē mou tous kuklous taratte!). The tomb of Archimedes carried a sculpture illustrating his favorite mathematical proof, consisting of a sphere and a cylinder of the same height and diameter. Archimedes had proven that the volume and surface area of the sphere are two thirds that of the cylinder including its bases. In 75 BC, 137 years after his death, the Roman orator Cicero was serving as quaestor in Sicily. He had heard stories about the tomb of Archimedes, but none of the locals were able to give him the location. Eventually he found the tomb near the Agrigentine gate in Syracuse, in a neglected condition and overgrown with bushes. Cicero had the tomb cleaned up, and was able to see the carving and read some of the verses that had been added as an inscription. A tomb discovered in the courtyard of the Hotel Panorama in Syracuse in the early 1960s was claimed to be that of Archimedes, but there was no compelling evidence for this and the location of his tomb today is unknown. The standard versions of the life of Archimedes were written long after his death by the historians of Ancient Rome. The account of the siege of Syracuse given by Polybius in his The Histories was written around seventy years after Archimedes' death, and was used subsequently as a source by Plutarch and Livy. It sheds little light on Archimedes as a person, and focuses on the war machines that he is said to have built in order to defend the city. By placing a metal bar in a container with water on a scale, the bar displaces as much water as its own volume, increasing its mass and weighing down the scale. The most widely known anecdote about Archimedes tells of how he invented a method for determining the volume of an object with an irregular shape. According to Vitruvius, a votive crown for a temple had been made for King Hiero II of Syracuse, who had supplied the pure gold to be used, and Archimedes was asked to determine whether some silver had been substituted by the dishonest goldsmith. Archimedes had to solve the problem without damaging the crown, so he could not melt it down into a regularly shaped body in order to calculate its density. While taking a bath, he noticed that the level of the water in the tub rose as he got in, and realized that this effect could be used to determine the volume of the crown. For practical purposes water is incompressible, so the submerged crown would displace an amount of water equal to its own volume. By dividing the mass of the crown by the volume of water displaced, the density of the crown could be obtained. This density would be lower than that of gold if cheaper and less dense metals had been added. Archimedes then took to the streets naked, so excited by his discovery that he had forgotten to dress, crying "Eureka!" (Greek: "εὕρηκα, heúrēka! ", meaning "I have found [it]!"). The test was conducted successfully, proving that silver had indeed been mixed in. The story of the golden crown does not appear in the known works of Archimedes. Moreover, the practicality of the method it describes has been called into question, due to the extreme accuracy with which one would have to measure the water displacement. Archimedes may have instead sought a solution that applied the principle known in hydrostatics as Archimedes' principle, which he describes in his treatise On Floating Bodies. This principle states that a body immersed in a fluid experiences a buoyant force equal to the weight of the fluid it displaces. Using this principle, it would have been possible to compare the density of the crown to that of pure gold by balancing the crown on a scale with a pure gold reference sample of the same weight, then immersing the apparatus in water. The difference in density between the two samples would cause the scale to tip accordingly. Galileo considered it "probable that this method is the same that Archimedes followed, since, besides being very accurate, it is based on demonstrations found by Archimedes himself." In a 12th-century text titled Mappae clavicula there are instructions on how to perform the weighings in the water in order to calculate the percentage of silver used, and thus solve the problem. The Latin poem Carmen de ponderibus et mensuris of the 4th or 5th century describes the use of a hydrostatic balance to solve the problem of the crown, and attributes the method to Archimedes. The Archimedes' screw can raise water efficiently. A large part of Archimedes' work in engineering arose from fulfilling the needs of his home city of Syracuse. The Greek writer Athenaeus of Naucratis described how King Hiero II commissioned Archimedes to design a huge ship, the Syracusia, which could be used for luxury travel, carrying supplies, and as a naval warship. The Syracusia is said to have been the largest ship built in classical antiquity. According to Athenaeus, it was capable of carrying 600 people and included garden decorations, a gymnasium and a temple dedicated to the goddess Aphrodite among its facilities. Since a ship of this size would leak a considerable amount of water through the hull, the Archimedes' screw was purportedly developed in order to remove the bilge water. Archimedes' machine was a device with a revolving screw-shaped blade inside a cylinder. It was turned by hand, and could also be used to transfer water from a low-lying body of water into irrigation canals. The Archimedes' screw is still in use today for pumping liquids and granulated solids such as coal and grain. The Archimedes' screw described in Roman times by Vitruvius may have been an improvement on a screw pump that was used to irrigate the Hanging Gardens of Babylon. The world's first seagoing steamship with a screw propeller was the SS Archimedes, which was launched in 1839 and named in honor of Archimedes and his work on the screw. The Claw of Archimedes is a weapon that he is said to have designed in order to defend the city of Syracuse. Also known as "the ship shaker", the claw consisted of a crane-like arm from which a large metal grappling hook was suspended. When the claw was dropped onto an attacking ship the arm would swing upwards, lifting the ship out of the water and possibly sinking it. There have been modern experiments to test the feasibility of the claw, and in 2005 a television documentary entitled Superweapons of the Ancient World built a version of the claw and concluded that it was a workable device. Archimedes may have used mirrors acting collectively as a parabolic reflector to burn ships attacking Syracuse. The 2nd century AD author Lucian wrote that during the Siege of Syracuse (c. 214–212 BC), Archimedes destroyed enemy ships with fire. Centuries later, Anthemius of Tralles mentions burning-glasses as Archimedes' weapon. The device, sometimes called the "Archimedes heat ray", was used to focus sunlight onto approaching ships, causing them to catch fire. In the modern era, similar devices have been constructed and may be referred to as a heliostat or solar furnace. This purported weapon has been the subject of ongoing debate about its credibility since the Renaissance. René Descartes rejected it as false, while modern researchers have attempted to recreate the effect using only the means that would have been available to Archimedes. It has been suggested that a large array of highly polished bronze or copper shields acting as mirrors could have been employed to focus sunlight onto a ship. 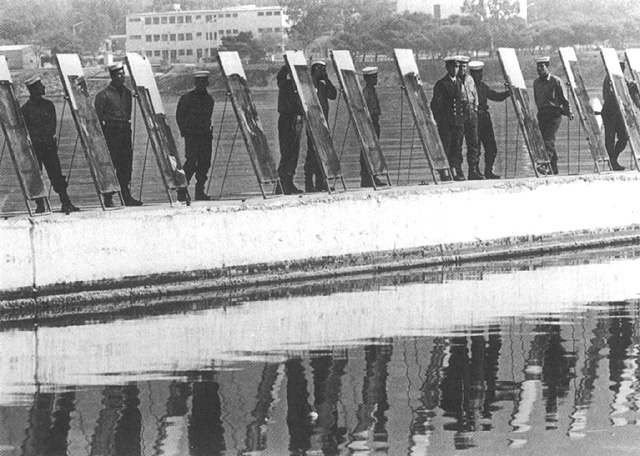 In October 2005 a group of students from the Massachusetts Institute of Technology carried out an experiment with 127 one-foot (30 cm) square mirror tiles, focused on a mock-up wooden ship at a range of around 100 feet (30 m). Flames broke out on a patch of the ship, but only after the sky had been cloudless and the ship had remained stationary for around ten minutes. It was concluded that the device was a feasible weapon under these conditions. The MIT group repeated the experiment for the television show MythBusters, using a wooden fishing boat in San Francisco as the target. Again some charring occurred, along with a small amount of flame. In order to catch fire, wood needs to reach its autoignition temperature, which is around 300 °C (570 °F). When MythBusters broadcast the result of the San Francisco experiment in January 2006, the claim was placed in the category of "busted" (or failed) because of the length of time and the ideal weather conditions required for combustion to occur. It was also pointed out that since Syracuse faces the sea towards the east, the Roman fleet would have had to attack during the morning for optimal gathering of light by the mirrors. MythBusters also pointed out that conventional weaponry, such as flaming arrows or bolts from a catapult, would have been a far easier way of setting a ship on fire at short distances. In December 2010, MythBusters again looked at the heat ray story in a special edition entitled "President's Challenge". Several experiments were carried out, including a large scale test with 500 schoolchildren aiming mirrors at a mock-up of a Roman sailing ship 400 feet (120 m) away. In all of the experiments, the sail failed to reach the 210 °C (410 °F) required to catch fire, and the verdict was again "busted". The show concluded that a more likely effect of the mirrors would have been blinding, dazzling, or distracting the crew of the ship. While Archimedes did not invent the lever, he gave an explanation of the principle involved in his work On the Equilibrium of Planes. Earlier descriptions of the lever are found in the Peripatetic school of the followers of Aristotle, and are sometimes attributed to Archytas. According to Pappus of Alexandria, Archimedes' work on levers caused him to remark: "Give me a place to stand on, and I will move the Earth." (Greek: δῶς μοι πᾶ στῶ καὶ τὰν γᾶν κινάσω) Plutarch describes how Archimedes designed block-and-tackle pulley systems, allowing sailors to use the principle of leverage to lift objects that would otherwise have been too heavy to move. Archimedes has also been credited with improving the power and accuracy of the catapult, and with inventing the odometer during the First Punic War. The odometer was described as a cart with a gear mechanism that dropped a ball into a container after each mile traveled. When Gallus moved the globe, it happened that the Moon followed the Sun by as many turns on that bronze contrivance as in the sky itself, from which also in the sky the Sun's globe became to have that same eclipse, and the Moon came then to that position which was its shadow on the Earth, when the Sun was in line. This is a description of a planetarium or orrery. Pappus of Alexandria stated that Archimedes had written a manuscript (now lost) on the construction of these mechanisms entitled On Sphere-Making. Modern research in this area has been focused on the Antikythera mechanism, another device built c. 100 BC that was probably designed for the same purpose. Constructing mechanisms of this kind would have required a sophisticated knowledge of differential gearing. This was once thought to have been beyond the range of the technology available in ancient times, but the discovery of the Antikythera mechanism in 1902 has confirmed that devices of this kind were known to the ancient Greeks. Archimedes used Pythagoras' Theorem to calculate the side of the 12-gon from that of the hexagon and for each subsequent doubling of the sides of the regular polygon. While he is often regarded as a designer of mechanical devices, Archimedes also made contributions to the field of mathematics. Plutarch wrote: "He placed his whole affection and ambition in those purer speculations where there can be no reference to the vulgar needs of life." Archimedes was able to use infinitesimals in a way that is similar to modern integral calculus. Through proof by contradiction (reductio ad absurdum), he could give answers to problems to an arbitrary degree of accuracy, while specifying the limits within which the answer lay. This technique is known as the method of exhaustion, and he employed it to approximate the value of π. In Measurement of a Circle he did this by drawing a larger regular hexagon outside a circle and a smaller regular hexagon inside the circle, and progressively doubling the number of sides of each regular polygon, calculating the length of a side of each polygon at each step. As the number of sides increases, it becomes a more accurate approximation of a circle. After four such steps, when the polygons had 96 sides each, he was able to determine that the value of π lay between 31/7 (approximately 3.1429) and 310/71 (approximately 3.1408), consistent with its actual value of approximately 3.1416. He also proved that the area of a circle was equal to π multiplied by the square of the radius of the circle (πr2). In On the Sphere and Cylinder, Archimedes postulates that any magnitude when added to itself enough times will exceed any given magnitude. This is the Archimedean property of real numbers. 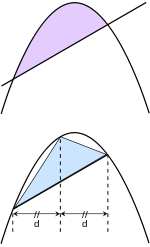 As proven by Archimedes, the area of the parabolic segment in the upper figure is equal to 4/3 that of the inscribed triangle in the lower figure. In Measurement of a Circle, Archimedes gives the value of the square root of 3 as lying between 265/153 (approximately 1.7320261) and 1351/780 (approximately 1.7320512). The actual value is approximately 1.7320508, making this a very accurate estimate. He introduced this result without offering any explanation of how he had obtained it. This aspect of the work of Archimedes caused John Wallis to remark that he was: "as it were of set purpose to have covered up the traces of his investigation as if he had grudged posterity the secret of his method of inquiry while he wished to extort from them assent to his results." It is possible that he used an iterative procedure to calculate these values. If the first term in this series is the area of the triangle, then the second is the sum of the areas of two triangles whose bases are the two smaller secant lines, and so on. This proof uses a variation of the series 1/4 + 1/16 + 1/64 + 1/256 + · · · which sums to 1/3. In The Sand Reckoner, Archimedes set out to calculate the number of grains of sand that the universe could contain. In doing so, he challenged the notion that the number of grains of sand was too large to be counted. He wrote: "There are some, King Gelo (Gelo II, son of Hiero II), who think that the number of the sand is infinite in multitude; and I mean by the sand not only that which exists about Syracuse and the rest of Sicily but also that which is found in every region whether inhabited or uninhabited." To solve the problem, Archimedes devised a system of counting based on the myriad. The word is from the Greek μυριάς murias, for the number 10,000. He proposed a number system using powers of a myriad of myriads (100 million) and concluded that the number of grains of sand required to fill the universe would be 8 vigintillion, or 8×1063. The works of Archimedes were written in Doric Greek, the dialect of ancient Syracuse. The written work of Archimedes has not survived as well as that of Euclid, and seven of his treatises are known to have existed only through references made to them by other authors. Pappus of Alexandria mentions On Sphere-Making and another work on polyhedra, while Theon of Alexandria quotes a remark about refraction from the now-lost Catoptrica. [b] During his lifetime, Archimedes made his work known through correspondence with the mathematicians in Alexandria. The writings of Archimedes were first collected by the Byzantine Greek architect Isidore of Miletus (c. 530 AD), while commentaries on the works of Archimedes written by Eutocius in the sixth century AD helped to bring his work a wider audience. Archimedes' work was translated into Arabic by Thābit ibn Qurra (836–901 AD), and Latin by Gerard of Cremona (c. 1114–1187 AD). During the Renaissance, the Editio Princeps (First Edition) was published in Basel in 1544 by Johann Herwagen with the works of Archimedes in Greek and Latin. Around the year 1586 Galileo Galilei invented a hydrostatic balance for weighing metals in air and water after apparently being inspired by the work of Archimedes. The first book is in fifteen propositions with seven postulates, while the second book is in ten propositions. In this work Archimedes explains the Law of the Lever, stating, "Magnitudes are in equilibrium at distances reciprocally proportional to their weights." Archimedes uses the principles derived to calculate the areas and centers of gravity of various geometric figures including triangles, parallelograms and parabolas. This is a short work consisting of three propositions. It is written in the form of a correspondence with Dositheus of Pelusium, who was a student of Conon of Samos. In Proposition II, Archimedes gives an approximation of the value of pi (π), showing that it is greater than 223/71 and less than 22/7. with real numbers a and b. This is an early example of a mechanical curve (a curve traced by a moving point) considered by a Greek mathematician. In this treatise addressed to Dositheus, Archimedes obtains the result of which he was most proud, namely the relationship between a sphere and a circumscribed cylinder of the same height and diameter. The volume is 4/3πr3 for the sphere, and 2πr3 for the cylinder. 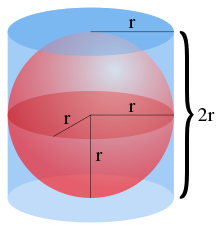 The surface area is 4πr2 for the sphere, and 6πr2 for the cylinder (including its two bases), where r is the radius of the sphere and cylinder. The sphere has a volume two-thirds that of the circumscribed cylinder. Similarly, the sphere has an area two-thirds that of the cylinder (including the bases). A sculpted sphere and cylinder were placed on the tomb of Archimedes at his request. This is a work in 32 propositions addressed to Dositheus. In this treatise Archimedes calculates the areas and volumes of sections of cones, spheres, and paraboloids. In the first part of this treatise, Archimedes spells out the law of equilibrium of fluids, and proves that water will adopt a spherical form around a center of gravity. This may have been an attempt at explaining the theory of contemporary Greek astronomers such as Eratosthenes that the Earth is round. The fluids described by Archimedes are not self-gravitating, since he assumes the existence of a point towards which all things fall in order to derive the spherical shape. In this work of 24 propositions addressed to Dositheus, Archimedes proves by two methods that the area enclosed by a parabola and a straight line is 4/3 multiplied by the area of a triangle with equal base and height. He achieves this by calculating the value of a geometric series that sums to infinity with the ratio 1/4. This is a dissection puzzle similar to a Tangram, and the treatise describing it was found in more complete form in the Archimedes Palimpsest. Archimedes calculates the areas of the 14 pieces which can be assembled to form a square. Research published by Dr. Reviel Netz of Stanford University in 2003 argued that Archimedes was attempting to determine how many ways the pieces could be assembled into the shape of a square. Dr. Netz calculates that the pieces can be made into a square 17,152 ways. The number of arrangements is 536 when solutions that are equivalent by rotation and reflection have been excluded. The puzzle represents an example of an early problem in combinatorics. The origin of the puzzle's name is unclear, and it has been suggested that it is taken from the Ancient Greek word for throat or gullet, stomachos (στόμαχος). Ausonius refers to the puzzle as Ostomachion, a Greek compound word formed from the roots of ὀστέον (osteon, bone) and μάχη (machē, fight). The puzzle is also known as the Loculus of Archimedes or Archimedes' Box. This work was discovered by Gotthold Ephraim Lessing in a Greek manuscript consisting of a poem of 44 lines, in the Herzog August Library in Wolfenbüttel, Germany in 1773. It is addressed to Eratosthenes and the mathematicians in Alexandria. Archimedes challenges them to count the numbers of cattle in the Herd of the Sun by solving a number of simultaneous Diophantine equations. There is a more difficult version of the problem in which some of the answers are required to be square numbers. This version of the problem was first solved by A. Amthor in 1880, and the answer is a very large number, approximately 7.760271×10206544. In this treatise, Archimedes counts the number of grains of sand that will fit inside the universe. This book mentions the heliocentric theory of the solar system proposed by Aristarchus of Samos, as well as contemporary ideas about the size of the Earth and the distance between various celestial bodies. By using a system of numbers based on powers of the myriad, Archimedes concludes that the number of grains of sand required to fill the universe is 8×1063 in modern notation. The introductory letter states that Archimedes' father was an astronomer named Phidias. 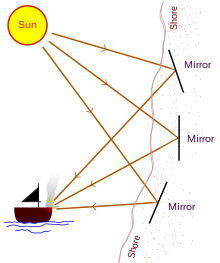 The Sand Reckoner or Psammites is the only surviving work in which Archimedes discusses his views on astronomy. This treatise was thought lost until the discovery of the Archimedes Palimpsest in 1906. In this work Archimedes uses infinitesimals, and shows how breaking up a figure into an infinite number of infinitely small parts can be used to determine its area or volume. Archimedes may have considered this method lacking in formal rigor, so he also used the method of exhaustion to derive the results. As with The Cattle Problem, The Method of Mechanical Theorems was written in the form of a letter to Eratosthenes in Alexandria. Archimedes' Book of Lemmas or Liber Assumptorum is a treatise with fifteen propositions on the nature of circles. The earliest known copy of the text is in Arabic. The scholars T.L. Heath and Marshall Clagett argued that it cannot have been written by Archimedes in its current form, since it quotes Archimedes, suggesting modification by another author. The Lemmas may be based on an earlier work by Archimedes that is now lost. It has also been claimed that Heron's formula for calculating the area of a triangle from the length of its sides was known to Archimedes. [c] However, the first reliable reference to the formula is given by Heron of Alexandria in the 1st century AD. The foremost document containing the work of Archimedes is the Archimedes Palimpsest. In 1906, the Danish professor Johan Ludvig Heiberg visited Constantinople and examined a 174-page goatskin parchment of prayers written in the 13th century AD. He discovered that it was a palimpsest, a document with text that had been written over an erased older work. Palimpsests were created by scraping the ink from existing works and reusing them, which was a common practice in the Middle Ages as vellum was expensive. The older works in the palimpsest were identified by scholars as 10th century AD copies of previously unknown treatises by Archimedes. The parchment spent hundreds of years in a monastery library in Constantinople before being sold to a private collector in the 1920s. On October 29, 1998 it was sold at auction to an anonymous buyer for $2 million at Christie's in New York. The palimpsest holds seven treatises, including the only surviving copy of On Floating Bodies in the original Greek. It is the only known source of The Method of Mechanical Theorems, referred to by Suidas and thought to have been lost forever. Stomachion was also discovered in the palimpsest, with a more complete analysis of the puzzle than had been found in previous texts. The palimpsest is now stored at the Walters Art Museum in Baltimore, Maryland, where it has been subjected to a range of modern tests including the use of ultraviolet and x-ray light to read the overwritten text. Galileo praised Archimedes many times, and referred to him as a "superhuman". Leibniz said "He who understands Archimedes and Apollonius will admire less the achievements of the foremost men of later times." There is a crater on the Moon named Archimedes (29.7° N, 4.0° W) in his honor, as well as a lunar mountain range, the Montes Archimedes (25.3° N, 4.6° W). 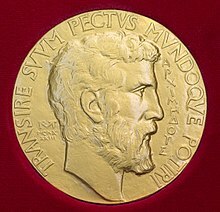 The Fields Medal for outstanding achievement in mathematics carries a portrait of Archimedes, along with a carving illustrating his proof on the sphere and the cylinder. The inscription around the head of Archimedes is a quote attributed to him which reads in Latin: "Transire suum pectus mundoque potiri" (Rise above oneself and grasp the world). Archimedes has appeared on postage stamps issued by East Germany (1973), Greece (1983), Italy (1983), Nicaragua (1971), San Marino (1982), and Spain (1963). The exclamation of Eureka! attributed to Archimedes is the state motto of California. In this instance the word refers to the discovery of gold near Sutter's Mill in 1848 which sparked the California Gold Rush. b. ^ The treatises by Archimedes known to exist only through references in the works of other authors are: On Sphere-Making and a work on polyhedra mentioned by Pappus of Alexandria; Catoptrica, a work on optics mentioned by Theon of Alexandria; Principles, addressed to Zeuxippus and explaining the number system used in The Sand Reckoner; On Balances and Levers; On Centers of Gravity; On the Calendar. Of the surviving works by Archimedes, T.L. Heath offers the following suggestion as to the order in which they were written: On the Equilibrium of Planes I, The Quadrature of the Parabola, On the Equilibrium of Planes II, On the Sphere and the Cylinder I, II, On Spirals, On Conoids and Spheroids, On Floating Bodies I, II, On the Measurement of a Circle, The Sand Reckoner. c. ^ Boyer, Carl Benjamin A History of Mathematics (1991) ISBN 0-471-54397-7 "Arabic scholars inform us that the familiar area formula for a triangle in terms of its three sides, usually known as Heron's formula — k = √s(s − a)(s − b)(s − c), where s is the semiperimeter — was known to Archimedes several centuries before Heron lived. Arabic scholars also attribute to Archimedes the 'theorem on the broken chord' ... Archimedes is reported by the Arabs to have given several proofs of the theorem." d. ^ "It was usual to smear the seams or even the whole hull with pitch or with pitch and wax". In Νεκρικοὶ Διάλογοι (Dialogues of the Dead), Lucian refers to coating the seams of a skiff with wax, a reference to pitch (tar) or wax. ^ "Archimedes". Collins Dictionary. n.d. Retrieved 25 September 2014. ^ "Archimedes (c. 287 – c. 212 BC)". BBC History. Retrieved 2012-06-07. ^ John M. Henshaw (10 September 2014). An Equation for Every Occasion: Fifty-Two Formulas and Why They Matter. JHU Press. p. 68. ISBN 978-1-4214-1492-8. Archimedes is on most lists of the greatest mathematicians of all time and is considered the greatest mathematician of antiquity. ^ Calinger, Ronald (1999). A Contextual History of Mathematics. Prentice-Hall. p. 150. ISBN 978-0-02-318285-3. Shortly after Euclid, compiler of the definitive textbook, came Archimedes of Syracuse (ca. 287 212 BC), the most original and profound mathematician of antiquity. ^ "Archimedes of Syracuse". The MacTutor History of Mathematics archive. January 1999. Retrieved 2008-06-09. ^ Sadri Hassani (11 November 2013). Mathematical Methods: For Students of Physics and Related Fields. Springer Science & Business Media. p. 81. ISBN 978-0-387-21562-4. Archimedes is arguably believed to be the greatest mathematician of antiquity. ^ Bursill-Hall, Piers. "Galileo, Archimedes, and Renaissance engineers". sciencelive with the University of Cambridge. Archived from the original on 2007-09-29. Retrieved 2007-08-07. ^ "Archimedes – The Palimpsest". Walters Art Museum. Archived from the original on 2007-09-28. Retrieved 2007-10-14. ^ Plutarch (October 1996). Parallel Lives Complete e-text from Gutenberg.org. Project Gutenberg. Retrieved 2007-07-23. ^ O'Connor, J.J.; Robertson, E.F. "Archimedes of Syracuse". University of St Andrews. Archived from the original on 6 February 2007. Retrieved 2007-01-02. ^ "The Death of Archimedes: Illustrations". math.nyu.edu. New York University. ^ a b Rorres, Chris. "Death of Archimedes: Sources". Courant Institute of Mathematical Sciences. Archived from the original on 10 December 2006. Retrieved 2007-01-02. ^ Mary Jaeger. Archimedes and the Roman Imagination, p. 113. ^ Rorres, Chris. "Tomb of Archimedes: Sources". Courant Institute of Mathematical Sciences. Archived from the original on 9 December 2006. Retrieved 2007-01-02. ^ Rorres, Chris. "Tomb of Archimedes – Illustrations". Courant Institute of Mathematical Sciences. Retrieved 2011-03-15. ^ Rorres, Chris. "Siege of Syracuse". Courant Institute of Mathematical Sciences. Archived from the original on 9 June 2007. Retrieved 2007-07-23. ^ a b Vitruvius (2006-12-31). De Architectura, Book IX, paragraphs 9–12. Project Gutenberg. Retrieved 2018-12-26. ^ "Incompressibility of Water". Harvard University. Archived from the original on 17 March 2008. Retrieved 2008-02-27. ^ HyperPhysics. "Buoyancy". Georgia State University. Archived from the original on 14 July 2007. Retrieved 2007-07-23. ^ Rorres, Chris. "The Golden Crown". Drexel University. Archived from the original on 11 March 2009. Retrieved 2009-03-24. ^ Carroll, Bradley W. "Archimedes' Principle". Weber State University. Archived from the original on 8 August 2007. Retrieved 2007-07-23. ^ Rorres, Chris. "The Golden Crown: Galileo's Balance". Drexel University. Archived from the original on 24 February 2009. Retrieved 2009-03-24. ^ Casson, Lionel (1971). Ships and Seamanship in the Ancient World. Princeton University Press. ISBN 978-0-691-03536-9. ^ Dalley, Stephanie; Oleson, John Peter. "Sennacherib, Archimedes, and the Water Screw: The Context of Invention in the Ancient World". Technology and Culture Volume 44, Number 1, January 2003 (PDF). Retrieved 2007-07-23. ^ Rorres, Chris. "Archimedes' screw – Optimal Design". Courant Institute of Mathematical Sciences. Retrieved 2007-07-23. ^ "SS Archimedes". wrecksite.eu. Retrieved 2011-01-22. ^ Rorres, Chris. "Archimedes' Claw – Illustrations and Animations – a range of possible designs for the claw". Courant Institute of Mathematical Sciences. Retrieved 2007-07-23. ^ Carroll, Bradley W. "Archimedes' Claw – watch an animation". Weber State University. Archived from the original on 13 August 2007. Retrieved 2007-08-12. ^ Hippias, 2 (cf. Galen, On temperaments 3.2, who mentions pyreia, "torches"); Anthemius of Tralles, On miraculous engines 153 [Westerman]. ^ "World's Largest Solar Furnace". Atlas Obscura. Retrieved November 6, 2016. ^ John Wesley. "A Compendium of Natural Philosophy (1810) Chapter XII, Burning Glasses". Online text at Wesley Center for Applied Theology. Archived from the original on 2007-10-12. Retrieved 2007-09-14. ^ Bonsor, Kevin (2001-05-29). "How Wildfires Work". HowStuffWorks. Archived from the original on 14 July 2007. Retrieved 2007-07-23. ^ "Archimedes Death Ray: Testing with MythBusters". MIT. Retrieved 2007-07-23. ^ "TV Review: MythBusters 8.27 – President's Challenge". 2010-12-13. Retrieved 2010-12-18. ^ Rorres, Chris. "The Law of the Lever According to Archimedes". Courant Institute of Mathematical Sciences. Retrieved 2010-03-20. ^ Clagett, Marshall (2001). Greek Science in Antiquity. Dover Publications. ISBN 978-0-486-41973-2. Retrieved 2010-03-20. ^ Dougherty, F.C. ; Macari, J.; Okamoto, C. "Pulleys". Society of Women Engineers. Archived from the original on 18 July 2007. Retrieved 2007-07-23. ^ "Ancient Greek Scientists: Hero of Alexandria". Technology Museum of Thessaloniki. Archived from the original on 5 September 2007. Retrieved 2007-09-14. ^ Cicero. "De re publica 1.xiv §21". thelatinlibrary.com. Retrieved 2007-07-23. ^ Cicero (2005-02-09). De re publica Complete e-text in English from Gutenberg.org. Project Gutenberg. Retrieved 2007-09-18. ^ Noble Wilford, John (July 31, 2008). "Discovering How Greeks Computed in 100 B.C." The New York Times. Retrieved 2013-12-25. ^ "The Antikythera Mechanism II". Stony Brook University. Retrieved 2013-12-25. ^ Rorres, Chris. "Spheres and Planetaria". Courant Institute of Mathematical Sciences. Retrieved 2007-07-23. ^ "Ancient Moon 'computer' revisited". BBC News. November 29, 2006. Retrieved 2007-07-23. ^ Plutarch. Extract from Parallel Lives. fulltextarchive.com. Retrieved 2009-08-10. ^ Heath, T.L. "Archimedes on measuring the circle". math.ubc.ca. Retrieved 2012-10-30. ^ Kaye, R.W. "Archimedean ordered fields". web.mat.bham.ac.uk. Archived from the original on 2009-03-16. Retrieved 2009-11-07. ^ Quoted in Heath, T.L. Works of Archimedes, Dover Publications, ISBN 0-486-42084-1. ^ McKeeman, Bill. "The Computation of Pi by Archimedes". Matlab Central. Retrieved 2012-10-30. ^ Carroll, Bradley W. "The Sand Reckoner". Weber State University. Archived from the original on 13 August 2007. Retrieved 2007-07-23. ^ "Editions of Archimedes' Work". Brown University Library. Archived from the original on 8 August 2007. Retrieved 2007-07-23. ^ Van Helden, Al. "The Galileo Project: Hydrostatic Balance". Rice University. Archived from the original on 5 September 2007. Retrieved 2007-09-14. ^ Heath, T.L. (1897). The Works of Archimedes (1897). The unabridged work in PDF form (19 MB). Cambridge University Press. Archived from the original on 6 October 2007. Retrieved 2007-10-14. ^ Kolata, Gina (December 14, 2003). "In Archimedes' Puzzle, a New Eureka Moment". The New York Times. Retrieved 2007-07-23. ^ Ed Pegg Jr. (November 17, 2003). "The Loculus of Archimedes, Solved". Mathematical Association of America. Archived from the original on 19 May 2008. Retrieved 2008-05-18. ^ Rorres, Chris. "Archimedes' Stomachion". Courant Institute of Mathematical Sciences. Archived from the original on 26 October 2007. Retrieved 2007-09-14. ^ "Graeco Roman Puzzles". Gianni A. Sarcone and Marie J. Waeber. Archived from the original on 14 May 2008. Retrieved 2008-05-09. ^ Krumbiegel, B. and Amthor, A. Das Problema Bovinum des Archimedes, Historisch-literarische Abteilung der Zeitschrift für Mathematik und Physik 25 (1880) pp. 121–136, 153–171. ^ Calkins, Keith G. "Archimedes' Problema Bovinum". Andrews University. Archived from the original on 2007-10-12. Retrieved 2007-09-14. ^ "English translation of The Sand Reckoner". University of Waterloo. Archived from the original on 11 August 2007. Retrieved 2007-07-23. ^ "Archimedes' Book of Lemmas". cut-the-knot. Archived from the original on 11 July 2007. Retrieved 2007-08-07. ^ O'Connor, J.J.; Robertson, E.F. (April 1999). "Heron of Alexandria". University of St Andrews. Retrieved 2010-02-17. ^ Miller, Mary K. (March 2007). "Reading Between the Lines". Smithsonian Magazine. Retrieved 2008-01-24. ^ "Rare work by Archimedes sells for $2 million". CNN. October 29, 1998. Archived from the original on May 16, 2008. Retrieved 2008-01-15. ^ "X-rays reveal Archimedes' secrets". BBC News. August 2, 2006. Archived from the original on 25 August 2007. Retrieved 2007-07-23. ^ Michael Matthews. Time for Science Education: How Teaching the History and Philosophy of Pendulum Motion Can Contribute to Science Literacy, p. 96. ^ Carl B. Boyer, Uta C. Merzbach. A History of Mathematics, chapter 7. ^ Friedlander, Jay; Williams, Dave. "Oblique view of Archimedes crater on the Moon". NASA. Archived from the original on 19 August 2007. Retrieved 2007-09-13. ^ "Fields Medal". International Mathematical Union. Archived from the original on July 1, 2007. Retrieved 2007-07-23. ^ Rorres, Chris. "Stamps of Archimedes". Courant Institute of Mathematical Sciences. Retrieved 2007-08-25. ^ "California Symbols". California State Capitol Museum. Archived from the original on 12 October 2007. Retrieved 2007-09-14. ^ Casson, Lionel (1995). Ships and seamanship in the ancient world. Baltimore: The Johns Hopkins University Press. pp. 211–212. ISBN 978-0-8018-5130-8. Wikisource has the text of the 1911 Encyclopædia Britannica article Archimedes. Boyer, Carl Benjamin (1991). A History of Mathematics. New York: Wiley. ISBN 978-0-471-54397-8. Dijksterhuis, E.J. (1987). Archimedes. Princeton University Press, Princeton. ISBN 978-0-691-08421-3. Republished translation of the 1938 study of Archimedes and his works by an historian of science. Gow, Mary (2005). Archimedes: Mathematical Genius of the Ancient World. Enslow Publishers, Inc. ISBN 978-0-7660-2502-8. Heath, T.L. (1897). Works of Archimedes. Dover Publications. ISBN 978-0-486-42084-4. Complete works of Archimedes in English. Netz, Reviel; Noel, William (2007). The Archimedes Codex. Orion Publishing Group. ISBN 978-0-297-64547-4. Pickover, Clifford A. (2008). Archimedes to Hawking: Laws of Science and the Great Minds Behind Them. Oxford University Press. ISBN 978-0-19-533611-5. Simms, Dennis L. (1995). Archimedes the Engineer. Continuum International Publishing Group Ltd. ISBN 978-0-7201-2284-8. Stein, Sherman (1999). Archimedes: What Did He Do Besides Cry Eureka?. Mathematical Association of America. ISBN 978-0-88385-718-2. "Archimedes and the Square Root of 3". MathPages.com. "Archimedes on Spheres and Cylinders". MathPages.com.